KIEV, Ukraine -- Three years ago, well before the war in Ukraine began, Roman Matys was shopping at Tommy Hilfiger in downtown Lviv when a sales clerk offered him a customer loyalty card. Soldiers of the Ukrainian self-defense battalion Azov take part in a procession to mark the Day of Ukrainian Cossacks. As Matys read the registration form, he noticed it was in Russian. Like most people in Ukraine, he speaks the language, but the principle of the matter annoyed him. The country has only one official language—Ukrainian—so Matys complained to the clerk, who told him the forms came from the company’s head office in Odessa. There was nothing, the salesman said, he could do about it. It wasn’t the first time Matys, a business consultant, had complained about companies using Russian on commercial documents in Ukraine. But that afternoon in Lviv, something clicked. Matys started I Tak Poymut, a nongovernmental organization dedicated to promoting the Ukrainian language. The name, which translates to “They’ll Understand Either Way,” is a sardonic reference to the phrase Matys often hears when he points out all the Russian-language labels, pamphlets and electronic operating systems to companies in Ukraine. His efforts to promote Ukrainian are part of the country’s larger struggle against Moscow. But here in this former Soviet state, many still prefer to speak Russian. Almost a year ago, when fighting began in eastern Ukraine, pro-Kremlin news outlets used the battle over language to strengthen support for separatism in predominantly Russian-speaking parts of the country. Today, the war has left more than 6,100 dead, and as the conflict continues, so too does the battle over Ukraine’s national language. 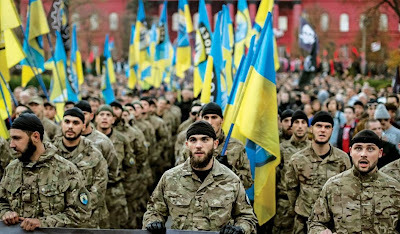 “Throughout our history, Ukrainian has always lost out to Russian,” says Tatyana Portnova, a history professor at Dnipropetrovsk University, in eastern Ukraine. Some people believe that if we don't nationalize everything—like schools, literature, TV and public spaces—we will lose again. And the consequence will be a Russian intellectual and political invasion. In 1996, well after Ukraine’s independence, the country made Ukrainian its national language. There hasn’t been an official census here since 2001, but at that time, 67.5 percent of people called Ukrainian their native language, compared with 29.6 percent who favored Russian. The major cities tend to be bilingual, except those in the southeast, which are mainly Russian-speaking, while people living in the countryside predominantly speak Ukrainian. Parents can choose to send their children to Ukrainian- or Russian-language schools, but most students take their final exams in Ukrainian, which is used in universities. Russian, however, still dominates most newspapers, popular television shows and businesses. And Matys would like to change that. His organization, which has more than 9,200 Facebook members, is launching social media campaigns to demand Ukrainian-language advertising, and it takes companies to court for refusing to comply. Consumer protection laws safeguard the rights of buyers to access information and products in Ukrainian. But the laws are written vaguely, and few companies seem to care. The main reason: rubles (or, I should say, Ukrainian hryvnias). Often, Matys says, international businesses want to save money in the former USSR states by running their offices out of Moscow and printing instruction manuals only in Russian. Violators are supposed to receive steep fines, but enforcement is scant. He and his cohorts tend to make their demands to a company’s corporate office in Ukraine. The easiest sell, he says, was Toyota, which responded quickly and without protest in 2012. Today, it has a Ukrainian-language website and offers Ukrainian in its cars’ electronic control panels. Other companies haven’t been so accommodating. Three years ago, an activist ordered a Samsung washing machine online. When the vendor delivered it, the machine’s labels were in Russian. The activist returned it and received a refund. But he still wanted a Samsung machine with Ukrainian labels. Getting one proved to be difficult, as neither Samsung’s local office in Ukraine nor its regional headquarters in Moscow would explain why it wasn’t possible, Matys says. The case went to court, and Samsung eventually caved. The company, which declined to comment in time for publication, now labels the devices it sells in Ukraine in the country’s national language. When Matys first started I Tak Poymut, he often felt as if no one was listening. When they did listen, they often laughed at him. But in the winter of 2013, as thousands gathered in Kiev’s Independence Square, demanding economic integration with Europe instead of Russia, Matys’s ideas no longer seemed so crazy. As the demonstrations continued, Ukraine’s security services began a violent crackdown, which many believe had the Kremlin’s blessing. The protesters eventually forced the resignation of President Viktor Yanukovych, a pro-Russian leader. But as a new government in Kiev took over, Moscow began to use private television and social media to fuel separatist sentiment in Crimea and eastern Ukraine. Before long, what began as mere protests turned into an all-out rebellion by pro-Russian separatists, and many in Ukraine became suspicious of Moscow’s meddling. “People realized that we have a real enemy,” Matys told Newsweek, "and this real enemy speaks in Russian. The government also seemed on board. Last February, after Yanukovych fled the country, the Ukrainian parliament repealed legislation allowing Russian to be used as an official regional second language. Though Ukraine’s then-interim president, Oleksandr Turchynov, vetoed the measure, alarmist reports from pro-Kremlin media outlets unnerved the country’s predominantly Russian-speaking East. This year, in early April, the country outlawed Russian TV shows that glorify Russia’s security services. For Matys, these bans were a matter of utmost importance. But not everyone feels good about surging Ukrainian nationalism. Vladislav Breeg, editor-in-chief of the pro-Russian website Novorossia Today, believes that much of the debate over language and patriotism is just a way for the new government to distract the masses. “Different people came to power,” he says. As the war has worn on, Matys says, his efforts have become more difficult. But not for the reasons that Breeg describes. Instead, many in Ukraine would now like to find common ground with their friends and neighbors. Among them is Joseph Zissel, a professor of Jewish Studies at the National University of Kiev-Mohyla Academy. Many of the participants in the Kiev protests, he says, were ethnic Russians who are also proud Ukrainians, a sign that the country is less divided along linguistic or ethnic lines. “We always thought...language was the major sign of identity,” says Zissel. "It turns out it isn’t. Every day on TV there are interviews from the front line, soldiers and officers, many speaking Russian” and fighting against the separatists. For Matys, the country’s new push toward inclusivity has become difficult to overcome. And though the government appears firmly on his side, consumers and business leaders seem unsure. They don’t want to alienate pro-Ukrainian Russian speakers during a time of war. Matys, however, isn’t giving up. “I’m not interested in which language you speak at home or which language you’re more comfortable with,” he says.